Santa Cruz is called “Surf City” for a reason and there’s plenty of coastline to enjoy, whether you’re paddling out or just relaxing on the sand. This blog post will cover the best beaches in town, from the popular and crowded to the scenic and less-traveled. 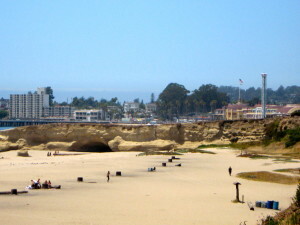 Seabright State Beach – Seabright State Beach is on the midtown side of the Boardwalk, opposite of Main Beach. As such, it is a bit more touristy and crowded than some other beached, but it does offer a different experience that is a good time, especially around “beach holidays,” which means any sunny day that most people have off of work. Seabright is a large beach with plenty of space to set up shop, build a bonfire, and bring your dog (on-leash only). Its Beach – Its Beach at Lighthouse Field State Beach is one of the most popular beaches on Santa Cruz’s Westside, in part due to the fact that it is a dog-friendly beach. Situated right near the lighthouse, which is home to a surfing museum, as well as world-renowned surf spot Steamer Lane, Its Beach is enjoyed by tourists and locals alike. Whether taking your dog for a run on the beach or just strolling by for a sunset view, it’s easily one of the best spots in town to relax and enjoy the ocean vibe along West Cliff Dr.
Seacliff State Beach – Located in Aptos on State Park Dr., Seacliff State Beach is another of Santa Cruz County’s signature beaches. Unlike the others on this list, it has a pier, which is often used for fishing. There is also a concrete ship, the SS Palo Alto, permanently situated at the end of the pier. The SS Palo Alto has an interesting history of how it came to the area as an unused WWI tanker ship. Pleasure Point – Pleasure Point is one of the most popular surf spots in the area, located just south of Santa Cruz in nearby Capitola. The Point is also home to wet suit inventor and local icon, Jack O’Neil, which only adds to the allure of the famous breaks and surf contests held here. While it doesn’t offer much in terms of actual beach space, it is one of the best places to soak up some sun and watch the surfers. 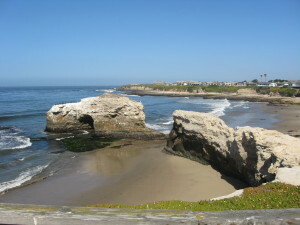 Natural Bridges State Beach – Natural Bridges, at the end of West Cliff Dr., may very well be the crown jewel of Santa Cruz beaches. It’s a great spot to park and take in the view of the bird-covered rocks and what remains of the natural bridges. Or you can stroll down to the beach to stick your toe in the water. The beach itself tends to be less crowded than some others, but it is a popular destination for cars that drive along West Cliff, particularly at sunset.